Logan Marshall-Green as Grey Trace (yes, seriously) in Upgrade. Upgrade lives up to its name in more than one way. It presents a series of tropes you already knew and polishes them up with modern executions, giving us a main character ready to star in updated version of the Six Million Dollar Man. On one level, the film, written and directed by Leigh Whannell (Saw, Insidious), trots out a very familiar sort of action-hero origin story: Victimized by violent crime in a cyberpunk future, main character Grey Trace (Logan Marshall-Green) vows to hunt down the men who killed his wife. Upgrade seems to know that viewers will know the film’s plot beats, and then uses that meta-awareness in clever and surprising ways. We first meet Grey when he’s working on restoring a vintage Pontiac Firebird automobile. (Firebird is another word for “phoenix” and that linkage is the movie giving clues straightaway about what’s going to happen.) Grey works on classic cars for others, but also because he’s a cranky technophobe—despite the near-future setting, his fully-automated home controlled by voice commands, and the fact that his wife Asha is an exec at a company that makes robot limbs for wounded soldiers. When Grey drives the Firebird to the person who wanted it restored—reclusive genius tech-bro Eron Keen—Asha accompanies him so he can get a ride back home in her fancy self-driving smart car. The couple discuss a bleeding-edge AI chip called STEM before leaving Keen’s remote underground home. On the back to their house, the self-driving car malfunctions and crashes, injuring them both. A group of cybernetically enhanced thugs tortures them and kills Asha, leaving Grey a widower who’s paralyzed from the neck down. His life is one of lonely misery until Keen visits him and says that he can implant STEM directly into his body, restoring his mobility and letting him seek vengeance. When Grey agrees, he starts hearing the AI’s voice in his head and discovers that it can enhance his sensory perception, cognition, and reflexes to superhuman degrees. Upgrade seems to know that viewers will know the film’s plot beats and uses that meta-awareness in clever and surprising ways. Some moments in Upgrade appear to be diving headfirst into the expectations of genre fans. When Grey is rehabbing his body after the STEM chip implant, he’s running on a treadmill that tracks his speed as Keen looks on. Yep, just like Steve Austin in the opening montage of the Six Million Dollar Man. The strange-bedfellows relationship between Grey and STEM echoes the one that Michael Knight and KITT had on Knight Rider, too. The human half of the partnership even asks the AI “Can you read my mind?” a la Lois Lane in 1978’s Superman: The Movie. Those genre elements sit inside a super-surveillance future that looks more like one we’d imagine nowadays, right next other ol’-reliable touches like a police detective who suspects there’s more to Grey than it seems. For all its winking nods, Upgrade is actually more concerned about messing with what you think is going to happen. Whannell’s delivered a crowdpleaser with bite; its impressive and gory fight scenes get added tension because the conceit is that it’s STEM doing all the punching and parrying. Some of what you might predict for the character archetypes and plot threads in the movie does happen and some of it doesn’t. 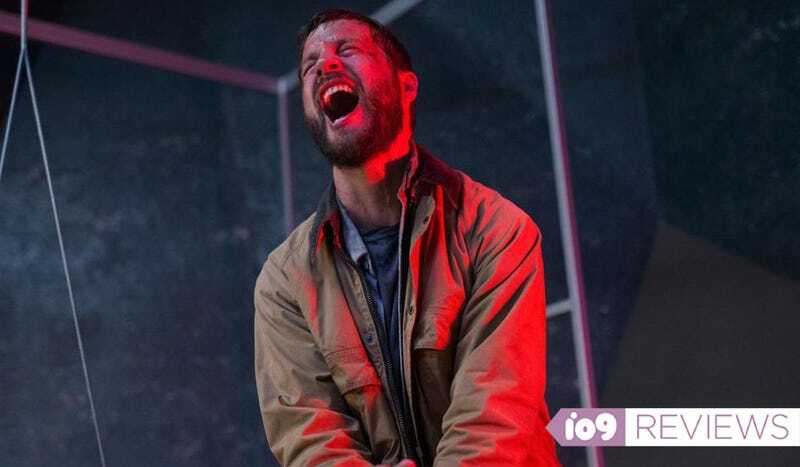 Upgrade plays like a would-be scifi pilot for most of its runtime, but the ending is the culmination of a whole other tonal throughline—one that lurks under the skin of the action choreography like STEM lives inside Grey. Upgrade screened at SXSW 2018 this March and will be coming out on June 1. G.I. Joe&apos;s Next Comic Book Opponent Is... The Six Million Dollar Man? !